Over the past two decades, the aerospace industry has been going through a gradual transformation driven by new technologies. The aerospace and defense industry is at the forefront of development, using cutting edge technology to ensure relevancy and the ability to secure a country’s safety and survival. An ideal electronic design for the aerospace industry should be reliable, flexible, and able to withstand extreme conditions such as stringent shock, vibration, and wide operating temperature ranges. Finally, the system must be future-proof. Many factors must be taken into consideration when developing a system for this sector, including the characteristics of the device with different technologies, environmental effect, fast design life cycle, and overall cost of the system. EDA stands for Electronic Design Automation. As electronics become more complicated and pervasive, EDA tools are vital to the continued success of these electronics designs. EDA provides the critical technology to design electronics that enable a fast and reliable design solution. Based on new aerospace design challenges, EDA has completely transformed the way that electrical engineers design, simulate, and manufacture circuits. EDA tools are necessary to reduce cost, save time, and make design cycles fast because EDA automates various design tasks and provides feedback that enables designers to correct design issues before entering the costly manufacturing phase. This article discusses a typical remote sensing satellite system using the latest EDA technology. This system contains a multi-technology based T/R module, a complex large phased array antenna, multimode tracking system and high-speed interconnects in backplanes to transfer data. EDA technology such as interoperable process design kits (PDKs), multi-technology based System-on-Chip design, electromagnetic simulation technique, powerful GPU computing, and signal integrity analysis are covered with these designs. Satellites play a key role in remote sensing, navigation, and surveillance. The purpose of a remote sensing satellite is to collect remote sensing data and transmit this data to the earth station. Remote sensing images are digital images. In order to get information from the images, image processing techniques are used to enhance the image to get a visual interpretation. After data processing data are stored in servers, these data transfer backplanes have high speed interconnects interfaces such as SATA to USB interconnect. Signal integrity analysis (i.e., signal quality) ensures error-free data transfer. Figure 1 shows the electronics design challenges of four systems used in remote sensing satellite and earth station systems. As semiconductor technology advances towards 14 nm technology and beyond, circuit design has become unprecedentedly complicated. New aerospace electronic products are extremely complex and the need for IC customization with low cost and increased complexity can be met by next-generation EDA tools. Today’s and next generation’s chipsets are likely to have several different types of components based on different technologies embedded into a single chip. Integrating many components onto a single chip enables numerous functions. Hence, such an increased integration requires innovations in EDA tools for designing chipsets, which enables better functionality. A transceiver system is used in phased array antenna beamforming systems. The multi-technology feature is a new technique for mixed microwave and RF systems designs where multiple chips based on different fabrication technologies such as RFIC, MMIC, LTCC, and Microstrip are combined on the same RF board. A system level block diagram of a T/R module is given in Figure 2. T/R module ICs have been designed using three different technologies as listed below. All these design modules are integrated into a single system-on-board chip. Design and simulation of a complete transceiver system are very challenging due to the presence of multiple technologies in one single design. Keysight Advanced Design System (ADS) Finite Element Method (FEM) based electromagnetic solver is used to analyze the complete module. A peak module output gain of 18.2 dB is achieved with an overall module efficiency of 21%. The performance of the complete system is analyzed using Finite Element Method (FEM) simulated data and circuit components using schematic co-simulation in ADS. The topology used in this system improves the system performance as well as reduces the chip size. 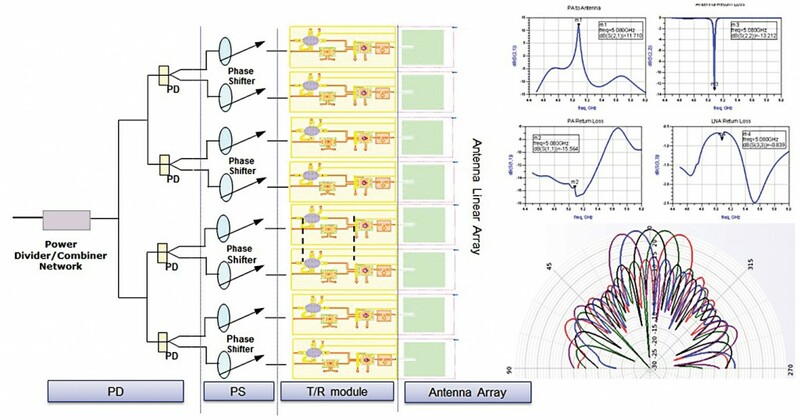 The transceiver system is applied in an active phase array to demonstrate beam sequencing with a variation of phase values as shown in Figure 3. A microwave imaging system that can produce a high-resolution image of the Earth is the synthetic aperture radar (SAR). Simulation tool capability and the way tools are used play an important role in design cycle time and cost. This design technology reduces total design iteration time significantly. Three different EM solvers are used efficiently for component level and integrated antenna design. SAR antenna is a multilayer microstrip stack of 8×8 arrays with a 5.2 GHz center frequency. This antenna operates at very high peak power of 6KW and PRF 1.2%. 1:8 square coaxial feeder networks are used to handle the high power demand of antenna. This is a complex design and it’s very difficult to simulate a complete system using a single electromagnetic solver. A mixed electromagnetic simulation technique as shown in Figure 4 is used to simulate this array antenna that reduces the design cycle by 50%. Radiating arrays are planar in nature, so this is realized using 3D-planar Momentum EM solver and the high power Square-Coaxial-Line (SCL) feed network of the antenna is designed using FEM electromagnetic solver. This project is very large for simulation but by applying iterative solver and mesh refinement techniques, simulation time has been reduced by 40%. After optimizing the radiating element and feed network separately, the complete integrated antenna system is simulated with FDTD (Finite Difference Time Domain) solver. FDTD simulation can handle much bigger designs compared to FEM solver. The complete antenna system and simulation result are shown in Figure 5. The design of a unique multimode extractor for feed chain of monopulse tracking feed used for earth station antenna at Ka band is given here. This is a new concept to extract the first 5 higher order modes of a circular waveguide as shown in Figure 6. The multi-mode extractor couples the first five circular waveguide propagation modes TE11, TE110 (TE11 orthogonal mode), TM01, TE21, and TE21O (TE21 orthogonal mode) that includes the three tracking signals (i.e. sum signal, elevation signal, and azimuth signal) used in a high-frequency monopulse tracking system and two communication channels for transmitting and receiving a signal at Ka band. This design is based on amplitude and phase characteristics of the higher-order modes TM01, TE21, and TE21O excited in a circular waveguide. TE21 and TE21O mode are extracted from circular waveguide to TE10 mode in the rectangular waveguide by two longitudinal slots milled in the circular waveguide. 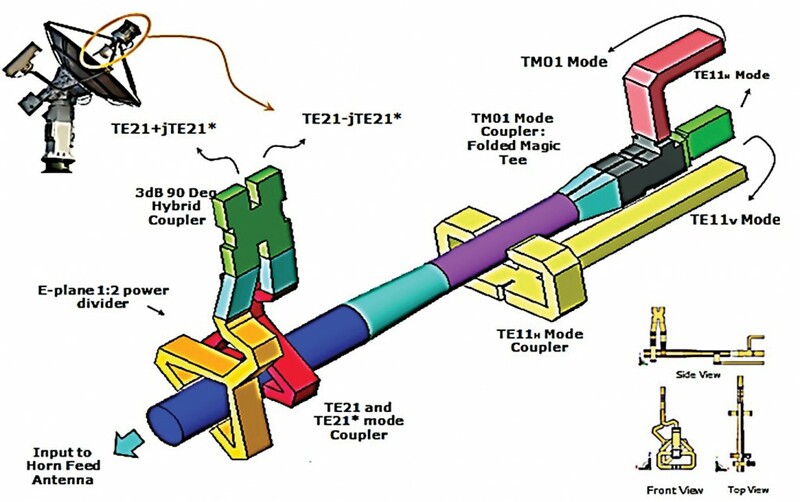 TE11 mode is coupled using two coupling slots and an H-plane power combiner. A turnstile junction is used to extract TM01 and TE110. This multimode tracking system is designed for ground earth station antennas to track orbiting satellites. As this is a complex design, the complete design has been simulated through Finite Difference Time Domain Technique using a GPU card. Finite difference methods are widely used highly parallel algorithms for solving deferential equations. To improve the method’s calculation speed and realize large-scale computing with the numerical complex model, a multi-GPU environment using Compute Unified Device Architecture (CUDA) is used. The calculation speed with four GPUs was approximately 20 times faster than with a CPU. The simulated return loss and insertion loss characteristics of this hardware have been found to be better than –20 dB and 0.4 dB insertion loss over 0.25% frequency band around 29.3, as shown in Figure 7. SATA and USB 3.0 connectors are used in backplane to transfer satellite remote sensing data to servers. 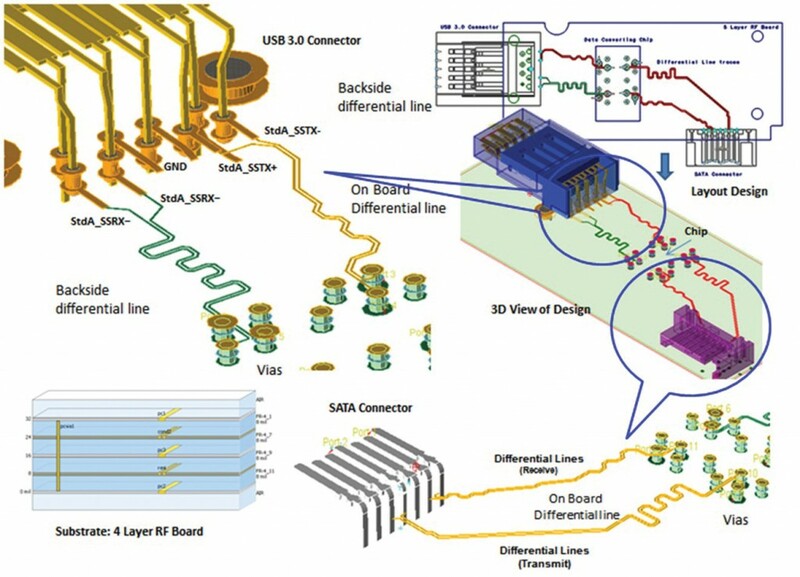 Signal integrity (SI) analysis of these high-speed interconnects integrated with RF board differential line traces is carried out by applying 3D electromagnetic simulation along with the transient circuit solver. 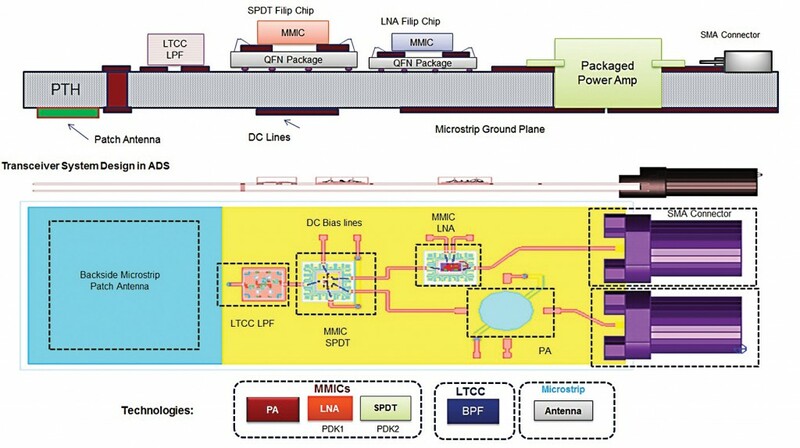 High-speed digital design, such as multiple power and ground planes, different IO chips and high-speed connectors requires improvement of integrated circuit operating speed and density. One of the major challenges in these techniques is impedance discontinuities that induce signal integrity (SI) and electromagnetic interference effects if you simulate boards and connectors separately. Full-wave 3D electromagnetic numerical analysis of high-speed and high-density interconnects along with high-speed board traces is a great challenge. This electromagnetic simulation approach provides a new process for such 3D components simulation as connectors using the Finite Element Method (FEM) solver and board designs using Method-of-Moment (MoM) based electromagnetic solver. The SATA-to-USB module is characterized by reflections, crosstalk, and power plane noise coupling problem to a data signal that can cause the false signal transition. The design process (Figure 8) demonstrates a unique methodology to reduce design production time significantly. Post-layout signal integrity analysis including connectors and the RF board is performed to know waveform quality, crosstalk, and timing for system-level design. In this project, instead of using separate S-parameter blocks of RF board and connectors for SI analysis, an integrated RF board along with high-speed USB and SATA connects are applied for channel simulation. SI analysis on integrated system gives accurate answers and avoids error-prone and time-consuming measurements, as shown in Figure 9. The channel simulator as shown in Figure 10 is used to check EYE opening of the complete channel in ADS. The channel simulator accounts for encoding, equalization, and crosstalk to high-speed digital designers. The Eye Probe gives an accurate analysis of eye diagram properties including BER contours, mask compliance, width, density, and height. Channel insertion loss is mainly dependent on system impedance profile, the material used, and impedance mismatch and crosstalk is created by capacitive or inductive between signal paths. A typical remote sensing satellite system is realized using latest the EDA techniques. Different blocks of system T/R module, phased array antenna, multi-mode tracking system, and high speed interconnects are designed using circuit and electromagnetic simulation techniques. It has been shown how the latest EDA technology such as interoperable process design kits (PDKs), multi-technology based System-on-Chip design, electromagnetic simulation technique, powerful GPU computing, and signal integrity analysis are useful to design a reliable aerospace system. A. T/R Module: Transceivers systems are used to send a command to the satellite to transfer data to earth stations. B. Phased Array Antenna: SAR system typically uses phased array radar with a cosec-square shaped beam to get the required elevation coverage. C. Multi-mode Tracking Coupler: Multimode coupler uses higher order modes to control earth station antenna direction as per satellite movement. D. High-Speed Interconnects – SATA to USB data transfer module is used to store data on the server. This module is characterized to minimize crosstalk, reflection, and power distribution network noise that can cause signal integrity problems.